The secrets of 17th century artists can now be revealed, thanks to 21st century signal processing. Using modern high-speed scanners and the advanced signal processing techniques, researchers at the Georgia Institute of Technology are peering through layers of pigment to see how painters prepared their canvasses, applied undercoats, and built up layer upon layer of paint to produce their masterpieces. The images they produce using the terahertz scanners and the processing technique - which was mainly developed for petroleum exploration - provide an unprecedented look at how artists did their work three centuries ago. The level of detail produced by this terahertz reflectometry technique could help art conservators spot previous restorations of paintings, highlight potential damage - and assist in authenticating the old works. Beyond old art, the nondestructive technique also has potential applications for detecting skin cancer, ensuring proper adhesion of turbine blade coatings and measuring the thickness of automotive paints. The study was reported November 8 in the journal Scientific Reports. "This technique allows us to see at high resolution what is beneath the surface of a painting, to assess in depth what kind of technique has been used, and to determine what defects may be present," said Alexandre Locquet, an adjunct professor in Georgia Tech's School of Electrical and Computer Engineering and a researcher at the Georgia Tech-CNRS international laboratory in Metz, France. "Using this, we can get information that art historians previously did not have, and we can provide information that may be helpful to the conservation and restoration of these old paintings." 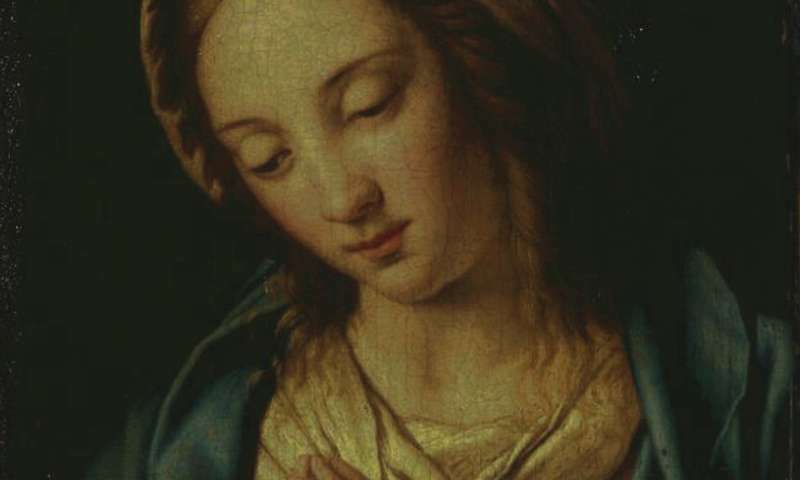 The researchers studied the painting "Madonna in Preghiera" by the workshop of Giovanni Battista Salvi da Sassoferrato, which was on loan from the Musée de la Cour d'Or, Metz Métropole, France. The examination began by placing the artwork face down on a gantry device designed to support the canvas without sagging. 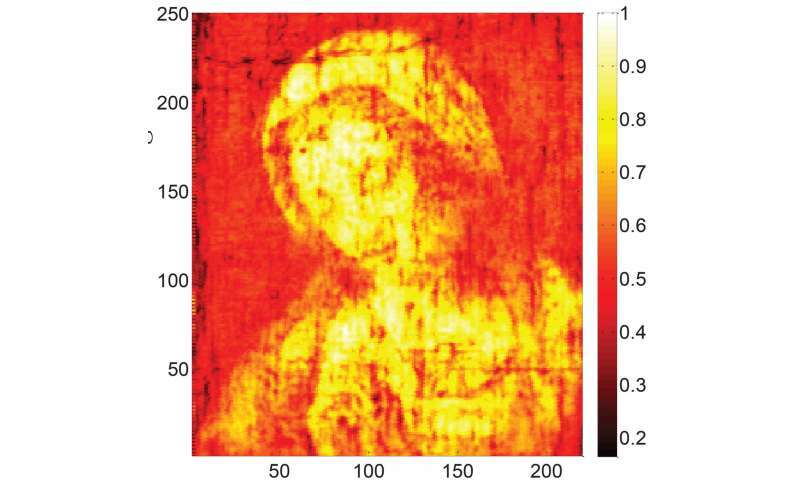 Using a commercial terahertz scanner, the painting was then examined approximately every 200 microns by pulses of terahertz radiation. The scanner consists of an electromagnetic wave generator, which emits signals that penetrated through successive layers of the painting. Portions of the beam reflected back from the paint, producing signals from each layer as the scanner moved across the painting in a raster pattern similar to that used to create television images. A computer using a signal processing technique known as sparsity-based time-domain deconvolution then processed the data, separating the signals reflected by each layer to construct a three-dimensional map of the image. The canvas support, ground, imprimatura, underpainting, pictorial and varnish layers were identified, along with a previously unknown restoration of the varnish. "Our technique is similar to the way in which seismology can be used to identify the various layers of rock in the ground," said David Citrin, a professor in the Georgia Tech School of Electrical and Computer Engineering. 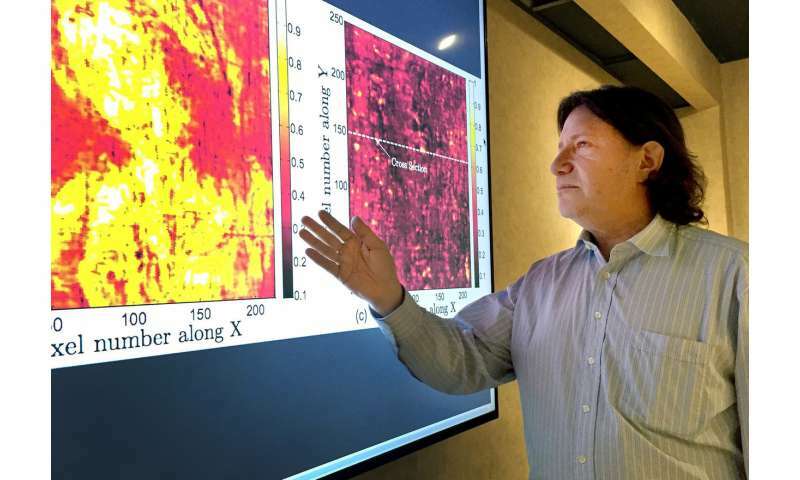 "In that case, seismologists send in an acoustic pulse and then measure the resulting echoes. In a similar way, we use a pulse of electromagnetic radiation at a frequency of around one terahertz and then look at the reflections off the various layers, a science known as stratigraphy." Without the signal processing, researchers might only be able to identify layers 100 to 150 microns thick. But using the advanced processing, they can distinguish layers just 20 microns thick. Paintings done before the 18th century have been challenging to study because their paint layers tend to be thin, Citrin said. Individual pigments cannot be resolved by the technique, though the researchers hope to be able to obtain that information in the future. "This is really quite significant, because for years people have tried to use raw data, but you really can't see much in that without processing the signals," he said. "It takes coupling the terahertz signals with the signal processing to really make a difference." Terahertz radiation, also known as submillimeter radiation, operates at tremendously high frequencies. It can easily penetrate layers of paint, though it can be blocked by conductive pigments such as carbon black. The terahertz imaging technique can supplement conventional art analysis techniques such as X-rays, nuclear magnetic resonance imaging, and optical imaging. The research team, which included graduate student Junliang Dong and collaborator Marcello Melis, has also studied other paintings, and plans to image a small part of a 12th century wood panel painting. That work will be challenging because the paint is thin and the wood surface damaged. Citrin believes the study is the first to detect individual paint layers in a pre-18th century work of art. "Different techniques provide different information that could be useful to art conservators and historians," he said. "Terahertz gives us the combined ability to image a large object relatively quickly and inexpensively. We have shown that you don't need a fancy system to extract useful information." Beyond paintings, Citrin's research group has also imaged a Byzantine coin through a thick layer of oxidation, and is attempting to read an inscription in a medieval lead funerary cross also obscured by an oxide layer. They are also collaborating with a research group in Hong Kong to use the technique for characterizing the layers of skin for skin cancer detection and with another group for measuring damage in composite materials. "Terahertz imaging is still an emerging field that has to find its best applications," said Locquet. "We are hoping to contribute to that, and are pleased to apply science and engineering to support the humanities."